The Oklahoma National Guard has joined local firefighters and the Red Cross to search for survivors in the wake of the devastating tornado. NBC's Gabe Gutierrez reports. MOORE, Okla. – On a soggy, miserable afternoon in Oklahoma, the search for survivors hit home. Sgt. Jennifer Wehr has lived in the state for the last 10 years. “Words can't describe everything we've been seeing right now,” she said. 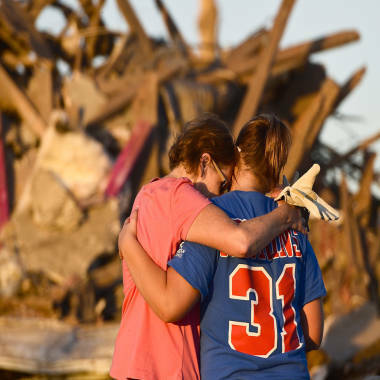 The Army Reservist was one of about 200 soldiers and airmen from the Oklahoma National Guard that helped sift through the rubble Tuesday in the aftermath of the EF5 tornado that tore through Moore. EF5 is the most severe level on the Enhanced Fujita scale that rates the strength of tornados and means the powerful storm is capable of lifting reinforced buildings off the ground and can hurl cars through the air. By Wednesday, the mission had transitioned into search and recovery. No bodies and no survivors have been found since Monday. But search crews – including local firefighters, search teams from Texas and Tennessee and the Oklahoma National Guard – are still pacing neighborhoods. Sgt. Mike Bell grew up in Oklahoma. He knows tornadoes well. He was part of the search and rescue effort during the EF5 tornado that ripped through Oklahoma and Kansas on May 3, 1999. That twister killed 46 people in the two states, 36 people in Oklahoma City alone, and leveled many of the same communities – resulting in about $1 billion worth of damage. Like most National Guardsman, he has the added the difficulty of working in familiar territory. It’s not often an Army reservist chokes up during an interview, but Bell did so when discussing the children who died during the tornado. Army Reserve Spc. Brian Cannon lives in Moore, just blocks from where the tornado hit. He said he dodged the storm by hunkering down with family in a storm shelter. The reservists have their work cut out for them helping with the clean-up. The Oklahoma Insurance Department estimates the damage from Monday’s twister that stretched for more than 17 miles could top $2 billion in damages.